We are eminent trader and supplier of Double Female Coupling which is superlative in quality. This coupling is widely used for the purpose of connecting pipes and hose. Our couplings are tested by a team of expert professionals for the purpose of quality controlling. 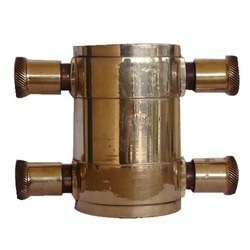 The offered couplings are widely appreciated across the country for their quality and durability. Our Double Female Coupling is offered at highly competitive market rates to our clients. We, Aristos Infratech from 2017 are wholesaling, manufacturing and trading a high-quality range of Fire Protection System. Offered products array consists of Fire Extinguisher, Fire Protection System, Hydrant Valves etc. All offered products are manufactured using high-grade basic material and latest technology. Also, these products have various attractive features like resistance from damage, ease of maintenance, perfect functioning, and lightweight. Also, we are offering Fire Safety Device Installation Service to our valued clients. Our years of experience in the industry have helped us in maintaining a cordial business relationship with our business partners as well as clients. With our tie-ups with famous vendors, we are able to offer products in line with patron’s requirements. Our vendor’s infrastructure is skillfully managed by experts. Also, we are able to deliver firefighting products on time at client’s end with a wide distribution network.